Good Morning Kitty, I just love your teapot and the darling cup. Looking forward to another exchange too. 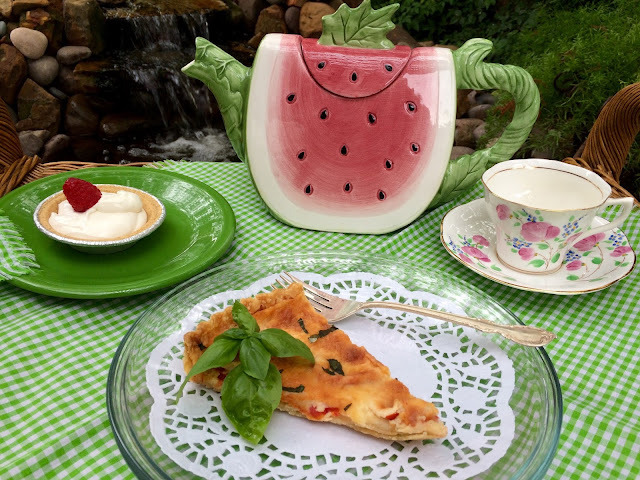 The tomato tart looks so delicious and the sweet little key lime pie looks so yummy. The perfect late summer afternoon lunch. Thanks for sharing the recipes. Anything with sweetened condensed milk is a winner in my book!! Your lunch looks tasty. Have a great day, Kitty! Looks delicious and refreshing! Have a great week. Such a fun tea table with the watermelon teapot. I love Key Lime pie and we know I've mastered your graham crust. ;-) When in Florida we can occasionally find a Key Lime ice cream which is yummy. Mm. Key Lime Pie sounds so refreshing in the heat. And tomatoes are so delicious just now. 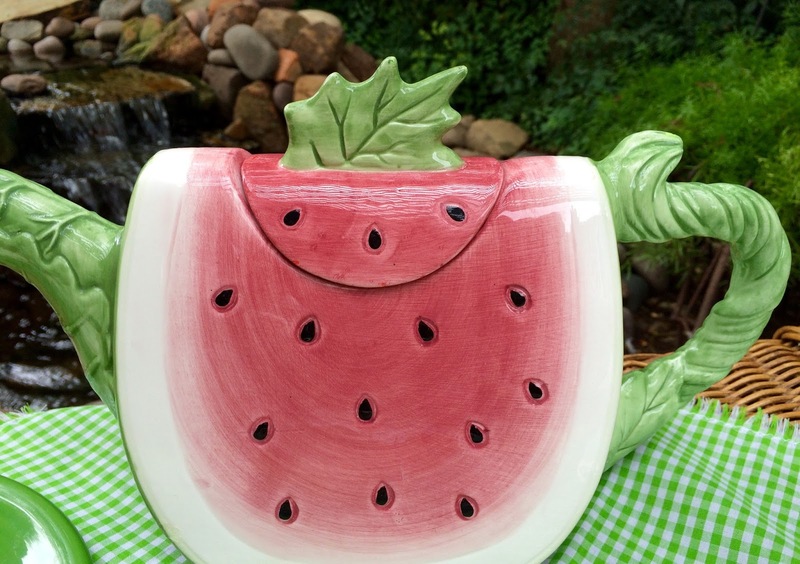 Your watermelon tea pot adds whimsy to your table. Yes, key lime pie is just the thing on hot summer days. Today felt like September (perhaps October) so I felt like baking apple pie. Yum, Kitty! What a delicious dessert that sounds and looks to be! Thank you for sharing! You have the best food ideas ever, Kitty!! That watermelon teapot is just adorable & the way you've displayed it, with the green & white gingham cloth just sets it off so nicely. 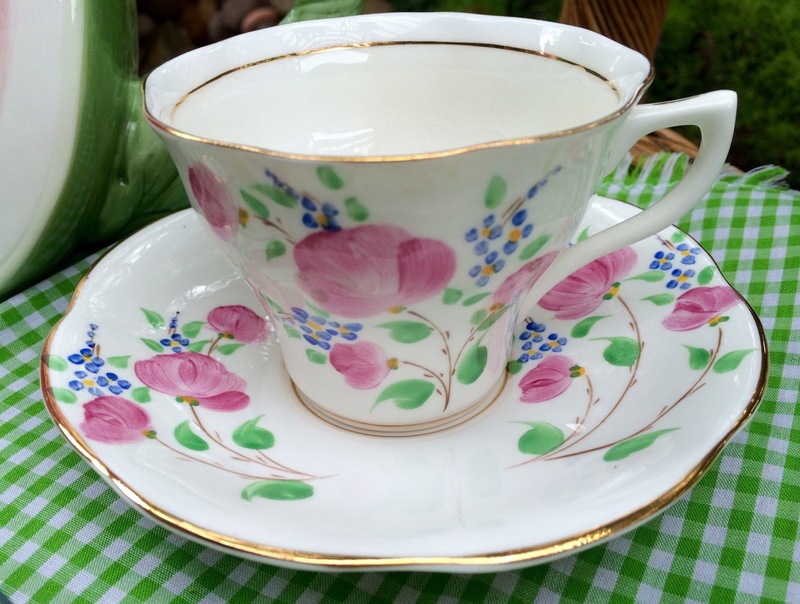 Very pretty teacup, too! We used to make key lime pie when we lived in FL with real FREE key limes. I think YOUR recipe sounds much easier. I shall try it as soon as I get some company to share it with. Oh my goodness Kitty, two of my favorite dishes. I love tomatoes and the tart looks so delicious. Key lime pie has to be close to the top of my favorites desserts. Love the pink and green tea tablescape. Yes, summer will soon be a memory and I am using a lot of my favorites dishes that will soon be put away. Kitty, that watermelon teapot is so adorable! I will have to look up in your past post what brand it is. My husband loves key lime pie. Thank you for posting the recipe! I would want to use the cute watermelon teapot again too. I could use a piece of your key lime pie but of course, I don't need it. Your tomato tart sounds good too. Thinking of you and your upcoming trip. The tea cup is beautiful. I participated in Stephanie's last tea cup exchange, and it was a lot of fun. Still pondering whether I should do the next one or take a break this time around. I do have a couple extra tea cups that could find new homes...so we'll see! Love your watermelon teapot! It probably goes without saying that I've never seen one like that before! I've copied your recipe for key lime pie--it looks simple enough that perhaps even I could make it. Thank you for sharing! Lots of gummies! I always love your watermelon teapot, and I LOVE your Rosina! It's certainly been hot, and your setting looks so cool. Thanks so much for linking to Tuesday Cuppa Tea! Adorable teapot! And that pie! Oh yum! It sounds easy to make and I know my son would like it so I may have to make it. Thanks for sharing the recipe! What a darling tea pot, Kitty! Oh I too would be using that as much as I could before the summer comes to an end. Another tea cup exchange...there is such beauty in those exchanges and I wait with anticipation every time. Just who will I meet and become dear friends with? Kitty, today I was cooking with ingredients from my garden. Thanks for the reminder about your tomato tart. I had pinned it, but hadn't tried making it yet. Love your cute watermelon pitcher! Key lime pie is always so refreshing for summer. Glad you will be linking to SYC. Hi Kitty, I bet the pie was so refreshing. Kitty, your teapot "shouts" summer in the happiest of ways! A coworker just gifted me with two pounds of lovely tomatoes from her garden. Too many for my salads this week. Can't wait to make the tart. It looks wonderful for breakfast, lunch or dinner. Yummy! The pie and the tart ~ :) Love your tea pot and the tea cup/saucer. You have such a beautiful collection. Kitty, this is lovely, one of my favorites. Easy peasy is a great way to have your cake and eat it too. This time, pie. Please try the Recipes Generator. If you can type in your blog post, then you can type in the recipes generator site. No logging on or anything. Key Lime anything is a weakness of mine! This looks very easy to make! Tomato tart sounds pretty good too! what a sweet teapot! Every time I see one in a shop I think of you! LOL! I am very much looking forward to the next swap! I'll be keeping my eye out for that! Was just going through all my fall decorations and saw my little pumpkin you gave me from the exchange a couple of years ago. It's so sweet! Have a great week Kitty! Hope all is well! Oooh.....that watermelon teapot. Now that is a beauty. What I wouldn't give to have a pretty like that in my collection! =) Your Key Lime Pie sounds positively delish!! Hello Kitty, both the recipes sound so good! I love the way the recipe looks so nice too! 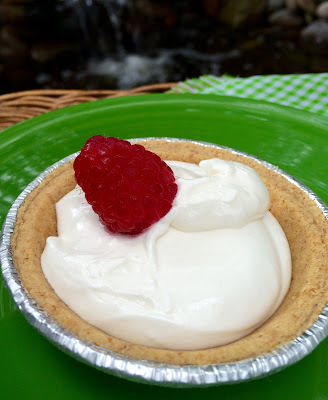 Thanks for taking the time to share your recipes with us each week at Cooking and Crafting with J & J.
Yum - the perfect summertime dessert - and easy, wow, who knew??? Good morning, sweet Kitty! How are you on this delightful Wednesday? Wishing you a joyous day, dear one. Much love to you! One of my favorite desserts hands down! What a precious tea pot too! I just clicked over and looked at that tomato tart, Kitty. It looks amazing!! Your Key Lime Pie would be the perfect dessert. Have a great weekend! Looking forward to seeing you again. Thank you for sharing this at Thoughts of Home! Kitty, isn't easy the way to go for summer! How can you go wrong with whipped cream, lime juice ... ! Oh Kitty, that pie sounds delicious!! It's just the ticket for us, since it was back to oh-so-hot and humid in N.C. again today. Sigh. Wow! Look at the the people who love love Kitty and her blog! Lots and lots. I think your pie looks wonderful and that cute watermelon teapot is adorable. Your cup and saucer are really pretty and hand painted. I love Rosina's! Thank you for sharing and linking. I love anything Key Lime or Meringue. Totally need to make this soon. I would love to join you for lunch Kitty. Your Tomato Tart and your Key Lime Pie look delicious, what a lovely lunch. Thanks so much for sharing with Full Plate Thursday this week and come back soon!